REACH and the Environmental Regulation of Nanotechnology presents a thorough and comprehensive legal analysis on the status of nanoscale chemicals under the EU’s REACH (Registration, Evaluation, Authorisation and Restriction) regulation, asking whether it effectively safeguards human health and environmental protection. This book examines the European Commission’s claim that REACH offers the best possible framework for the risk management of nanomaterials. 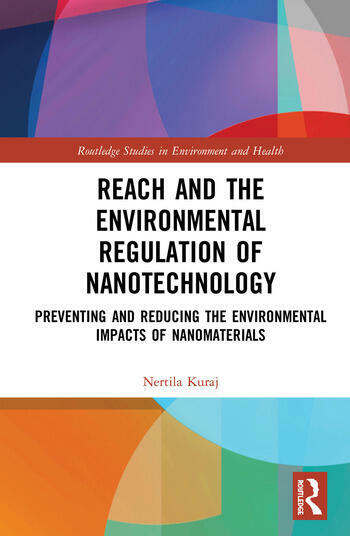 Through a detailed and meticulous analysis of the four phases of REACH, Kuraj assesses the capacity of the Regulation to protect human health and the environment against the potential harms associated with exposure to nanomaterials, and draws attention to the ways in which the specificities of nanoscale chemicals are (not) tackled by the current REACH framework. Overall, this book is an innovative and timely contribution to the ongoing debate on how to best address the unprecedented risks posed by the growing pursuit of nanotechnological innovation by the EU and global policy agenda. REACH and the Environmental Regulation of Nanotechnology will be of great interest to advanced students and scholars of environmental law and policy, environmental governance, science and technology studies, and environment and health. Nertila Kuraj is a Postdoctoral Research Fellow at the Department of Public and International Law, University of Oslo, Norway, and a Visiting Scholar at UC Berkeley School of Law.